This morning, I got a free Venti latte at Starbucks. Then, a co-worker brought in donuts. And, I’m wearing new black shoes and they have a small wedge and they make me feel 10 pounds lighter. Which, considering the latte and the donut, is a wonderful thing. Today marks what I consider my anniversary in the news business. 13 years ago I was a college kid telling a main anchor that I had dreams of covering the White House. I was there yesterday, at the White House. I brought home a pair of flip flops and a scarf of mine that had been there for months. I had flip flops and a scarf, just sitting in the White House. Little me. I was planning this really sweet, reflective post about having my professional dreams come true. Instead you’re going to get this. Because sometimes you get bad news at 8:30am on a random Friday. It’s not fair. It doesn’t make any sense. I read through a Facebook post from a friend this morning that Jonathan Bartlett died. A little back story now. As journalists, we write stories every day. Of course, we are trained and we try as best we can to remain objective. We’re especially on guard when we write about legal cases or politics. And every now and then a “story” becomes more than a story, even to us. Some things break through the crusty, cynical, hard nosed reporters and force us to connect on a very human level. Jonathan Bartlett did that for me. I was producing a local newscast in Hampton Roads, Virginia at the time. Happily cruising along my dream job path working at WAVY-TV, the station I watched growing up. Never before, and never since, have I felt so connected to a local community, probably because it was my own town. Anyway, my newscast often featured reports filed by our military reporter, Patty Culhane. It was right in the middle of the Iraq War. 2004. 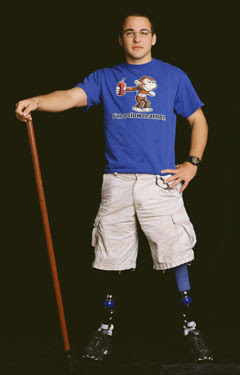 19 year old Jonathan Bartlett lost both of his legs because of an IED in Fallujah. Patty interviewed his family. We did stories on his recovery at Walter Reed and his homecoming. But, there was more than that. Like I said, it was one of those stories that wasn’t just a story. The community pulled together for Jon. Several of us from the TV station worked with other people in the community to modify Jon’s parents’ house for his wheelchair. I will never forget it. I still have the bracelet I got from a fundraiser for him. I come from a long line of Army guys. Both grandfathers, my dad, my brother (who hadn’t jet joined the Army at that time). I was brought up in a patriotic family. I learned at an early age that you honor the military, that no matter your views on whatever conflict our country is currently involved in, you must still love the warrior. I loved every single report Patty and our team did on Jonathan Bartlett. I was proud of him. I’ve continued to follow his story and pull for him from afar. Over the last year, I’ve gotten to know a handful of Wounded Warrior families at Walter Reed. It’s close to where I live now, and when I can, I like to cook for the warriors and their families, and deliver meals and just hang out with them and talk. I want them to know that I love them. Each and every single one of them. I’m thankful for them. I’m thankful for their service and their sacrifice. And I don’t care what they say or think, they will always be heroes to me. This morning, when I read about Jonathan Bartlett taking his own life, I broke down and cried. Right there at my desk at work. This is so upsetting. This cost of war is so raw, so real, and so not fair. I don’t understand why I got to grow up, work hard, and have my dreams come true and Jonathan grew up, worked hard, did his dream and got blown up and ended up this desperate. It may never make any sense. I pray for his family today with a broken heart. I pray for his friends, for my friends who grew really close to him. And I am reminded how important it is to pray for all of our Wounded Warriors, not only while they are in the hospital, or just out – completely focused on their recovery – but for years, forever, as they move on with their lives. Pray for their friends. And their families. Pray for all of our veterans. Forever. I pray for my little brother, who just got home from Afghanistan a few months ago. He also served in Iraq. I can’t even bear to let my mind wander and think of any struggles he may face. I can’t even go there. I pray for my dad, who served in Vietnam. I am so incredibly thankful for these men and women. Every single one of them. May we NOT EVER let them down. Suddenly, the fact that I have a seat in the White House Briefing room ceases to even matter. This stuff matters. Wow. Very well said. The enemy seeks to kill and destroy and you are so right, Dana, we must pray. So sorry. Thanking for loving so well & reminding me to love better! Oh sad...I too lived in Hampton Roads while my dad was stationed at Langley AirForce Base. When my dad retired from the Pentagon they made their "forever" home back there. What a great area that is so enriched with the military. I'm taking my 3 young girlz to Reagan Airport tomorrow to welcome an honor flight to see the wonderful memorials set up in their honor.Thanks to members of your family for their service to our great country.